As expats, we always say that living abroad changes us. Living in a foreign country teaches us valuable lessons, about ourselves and about the local culture and customs, which we experience first-hand. Different countries teach us different lessons. Sometimes, even though we leave a certain country, that country stays within us; we carry a little bit of it with us, no matter where we go next in the world. What is the most important thing each country has taught you? How did it change you and the way you think? What was the most valuable lesson you learned from living there? 1. The United States of America: It doesn’t matter where you come from; living the American dream is possible if you recognize the importance of hard work, creativity and ambition. I have been fortunate to live in the United States first as an expat child in New York City, later as a teenager and college student in Massachusetts, and finally as a young adult working my first job in Houston, Texas. I have lived in a pre-9/11 US and a post 9/11 US. Both times, I was warmly welcomed into the American fold of life, my diversity and international exposure and experience were welcomed, appreciated and recognized. In a country where being an immigrant is so part of the culture, I felt instantly like I belonged here. It didn’t matter where I was born or where I came from – but if I was willing to work hard and excel in my studies and my career, I felt the American dream was within reach. The value placed on hard work by American society means you are rewarded for your efforts. Creativity in the classroom is encouraged; you are encouraged to think out of the box. Ambition is a good thing, it gets you places. Building your life up from scratch, starting from nothing, achieving your goals – these are all values that Americans appreciate and can relate to. And if you are willing to work hard and chase your dreams, living in the United States is one of the best places to do so. Living in the US taught me the importance of ambition, creativity, and entrepreneurship, of the rewards that hard work and persistence can pay. It’s a lesson that has kept me humble, moulded my work ethic and carried me forward in life since then. 2. United Kingdom: Look for what you have in common with others; if you can speak in English, like to drink tea and love to watch a game of cricket – we are more similar than you think. Living in the giant melting pot that is the UK, I learned a very important lesson. Even though people may look different than myself, or speak a different language or come from a different place – we are all more similar than we think. One of my best friends in the UK came from Zimbabwe. On the surface, we had absolutely nothing in common, yet when we started talking to one another, we couldn’t stop. We shared a love for cricket, we both grew up in Commonwealth countries and could relate to so many shared experiences (like shopping for school shoes at Bata or studying for our ‘O’ and ‘A’ levels! ), and we both liked to have our evening tea time. Cultures wary, traditions differ but if you find yourself in a new country, surrounded by new people, try to focus on the similarities, rather than the differences. This will help you to relate to others, to understand them and to put yourself in their shoes. As an expat, this lesson has been so valuable in making new friends in each new country I go to. 3. Pakistan: The show must go on; the art of resilience in the face of strikes, corruption, political instability, poverty, natural calamities and economic hardship. Living in Pakistan, my home country, after many years abroad, was a shocker. At first I couldn’t cope. The electricity would go exactly when I needed to blow-dry my hair or iron my clothes. Schools and offices would shut down immediately in the wake of unrest or political rallies. Certain areas were declared no-go and I was confined to living my life in a bubble. Life in Pakistan is unpredictable – there is so much beauty to be found in the simplest of things, like the jasmine flower bracelets sold at every traffic signal in town, yet there is so much senseless violence and killing. When you sit down with a cup of tea and the newspaper in your hand every morning, you have no idea how your day will unfold. You don’t have a choice though; you put on a brave face and go about your day. Pakistani’s embody the true value of resilience. No matter what happens, no matter how bleak things look, they pick themselves up, and are determined to go through their day. Kids are sent to school, adults go to work, and life continues forwards. It is this quality of resilience that keeps Pakistan afloat. No matter what’s thrown at them, Pakistani’s persevere. This ability to carry forward, even in the face of adversity is what expat life is all about. It’s what I fall back to on hard times and tough days when I feel like giving up. It’s the single best life lesson that living in Pakistan has taught me. 4. Germany: We must never forget the lessons history teaches us or the hope it can give us. Enemies can become friends, war can be replaced with peace, and language is the gateway to understanding those different from you. Living in Berlin, I was always surrounded by history. All you had to do was look down to see the line where the Berlin Wall had run through the city, diving East Berlin from West Berlin and dividing Germany into two. I couldn’t take 2 steps in Berlin without seeing a remnant of its turbulent history. But all this was made even more remarkable by appreciating how far this country had come. Once responsible for starting a war on the European continent, it was now responsible for European peace and integration and it took this role pretty seriously. Its previous enemies like France, were now its staunch allies. Learning German was like opening a gateway into a different mind-set, of learning new values, a different way of thinking about the world, and of understanding the vital link between language with identity. Simple things like asking “how are you, how is everything?” in German would be asked by the phrase “Ist alles in Ordnung?” (is everything in order?) – keeping order is a vital tenant upon which life in Germany is built upon. “Ordnung” means order, efficiency, organization, discipline, cleanliness and punctuality – no phrase would warm the heart of a German more than hearing “yes everything is in order, everything is right, everything is as it should be.” Living in Germany taught me to appreciate the history of the country, and it also taught me whenever possible, to learn the language of the new place I find myself in, because this would be the single most important way of understanding my new country’s psyche. 5. Denmark: Live a balanced life; perfect the equilibrium between work and family life. Create a sense of “hygge” in your daily life; the ultimate Danish secret to happiness: I wasn’t at all keen to move to Copenhagen in the middle of winter. It seemed too dark, depressing and cold and I wasn’t sure if I would last through my first Scandinavian winter. I was intrigued though to learn that I was living in a country which was frequently voted as the happiest country in the world. Why were people here so happy, given the cold climate and high taxes? Amongst many factors, the two things that stuck out for me were firstly the way Danish society functioned on a 36 hour week. The Danes did not live to work. Work was important, but so was your life outside of work, like spending time with your family, pursuing your hobbies and meeting friends. It was socially acceptable to leave the office by 4:30 pm, go pick up your kids from “bornehave” (kindergarden) and eat dinner at home with your family. Working overtime in a consistent way did not mean you were a hard worker, only perhaps that you were an inefficient worker, because clearly you were not getting the job done during office hours. The Danes work less hours in a week than the average American, but they are more productive in the hours they do work. Maintaining a balance between work and family life is one thing the Danes get absolutely right, and this is backed by generous policies on maternity and paternity leaves for new mothers and fathers. 6. Singapore: The joy of living in a truly multilingual and multiracial society – Singapore taught me the true meaning of multiculturalism: Living in Singapore was like no other country I had lived in before. Mind you, I had lived in many cosmopolitan cities – New York City, London, Berlin etc. – but Singapore was not just cosmopolitan or diverse – Singapore was truly a model multilingual and multiracial society. Singapore’s population consisted of the Singaporean Chinese (the majority), a large Malay community, a very large South Indian population brought over in Colonial times, and of course many Western expats. This meant that the government had initiated laws and regulations to preserve and promote racial peace and harmony in Singapore. Simple things like acknowledging and giving a public holiday for Eid (or Hari Raya as it is known by its Malay word in Singapore), Diwali, Christmas, important Buddhist days and for Christmas meant that all religious or cultural holidays were not just observed, but celebrated in Singapore. Chinese kids grew up understanding the local Muslim Malay culture, the Malays grew up eating South Indian dosas and thaalis, the Western expats loved to celebrate Chinese New Year and society functioned on the basic premise of tolerance and peaceful co-existence by all. Singapore also has 4 official languages: Mandarin, English, Tamil and Malay. It is truly a multilingual society where each language is promoted and given equal status. It was thus Singapore that taught me my most important lesson as an expat: multiculturalism is the only way forward in a global, interconnected world. A world where languages mix, people interact and above all – tolerance, respect and understanding are paramount pillars of society. Singapore showed me that sometimes the smallest of countries can teach us the biggest lesson of all. 7. United Arab Emirates: You cannot forget your past, as you build your future. There can be no progress until the old and new, tradition and modernity go hand in hand. Like any newcomer to Dubai, I felt like I had landed in a city that was never finished. Construction sites and cranes are as much a feature of the desert, as are its sky scrapers. Before living here, I thought it was all about building the new, adding more shine and gleam to the city’s skyline and breaking more world records than anyone else. After living in the UAE for the past 2 years though, I have realized that the real reason why Dubai has made progress is that, while it looks to the future, it does not ignore its past. The humble origins of the Arabs and traditions and customs of the Bedouins who lived here are still very much part of today’s UAE. Falconry, camel racing, henna painting and camping in the desert are not just tourist activities, they point back to the roots of the people here. Offering dates to welcome you is the traditional Arab welcome, this is still observed today. When I walk into a restaurant, I find it refreshing to see menus in English and Arabic. Business is done in English, but customs and traditions and holidays are celebrated in Arabic. It is the perfect balance between being worldly and global, but not forgetting their roots and their language. It is precisely this lesson that I hope to pass on to my expat kids. 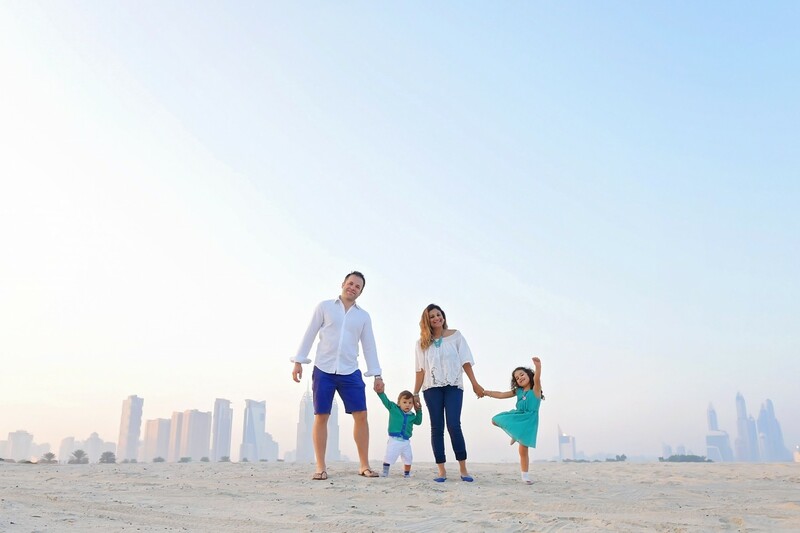 I am happy and grateful to be raising them in Dubai, where I feel they get to experience the best of both worlds. It has taught me to give my kids roots (teach them about where they come from) and wings (encourage them to fly and build a new future for themselves). Where have you lived and what have you learnt from your time there? I would love to hear about your experiences and your best bits from living around the world! Mariam is an eternal expat who 15 years, 7 countries and 3 continents later, is embarrassingly a seasoned expert at getting lost in every new city she calls home, and butchering words in every new foreign language she picks up along the way. She is the founder and writer of the blog ‘And Then We Moved To’ and writes mostly about life as an expat, trying to raise her multilingual and multicultural children in her East-meets-West marriage and of course traveling the world. Her work has been published on the Huffington Post, Expat Living Singapore, Expat Living Hong Kong, Expat Connect Dubai and Sassy Mama Dubai. You can connect with her on Facebook and follow her on Instagram @andthenwemovedto. Love it! Well written! Compliments! Thank you so much, happy you enjoyed the read!